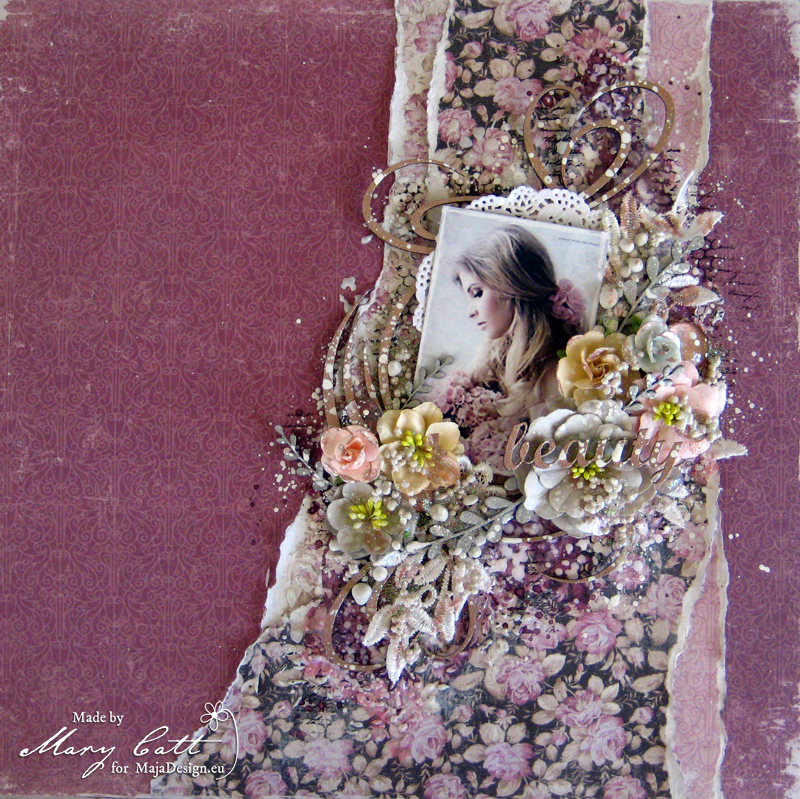 Today I’m up on Maja Design blog with a new layout featuring the Vintage Summer collection. I work with a photomontage I made. First, I primed the background with clear gesso. When done, I added some random stamping with different stamps and inks. Next, I colored the background with two inks. When dry, I added a design with a stencil and white crackle paste that I let dry naturally to allow the cracks to appear. When the paste was dried, I dry brushed the colored areas with white gesso to tone down the color. Next, I splattered some brown ink. I cut a few papers to add under the photo before gluing all the embellishments. Next, I added some mica flakes and microbeads. To finish, I added some random stamping. 22 March, 2018 - Cards, Ska Vi Ta En Fika? Hello and welcome, dear friends! I hope this lovely Tuesday finds you well. I’m back today with a new card, which twice in the same week, (kind of a record for me lately), and I couldn’t be happier to be here with you. For Today’s card I’m creating with another one of my favorite Maja Design collections, Ska vi ta en Fika. If you love purples as much as I do, this collection is a must-have for your craft room. Welcome to my happy place! Is there anything more magical than a secluded garden overflowing with lovely blooms? There is much joy to be found here involving all of the senses. Imagine being surrounded by the sweet fragrance of roses, or the delicate texture of a petal on your fingertips. For this reason there is much effort in the handcrafted flowers for this card, as I truly want to bring this garden to life. Below you’ll find some close ups of the handmade roses. The sentiment stamp speaks to my heart, for gardens truly are a place of miracles. A tiny key to the gates can be found in the corner of the card, as this garden is open to all who care to share in this space. A natural twine bow adorns the bottom of the card. 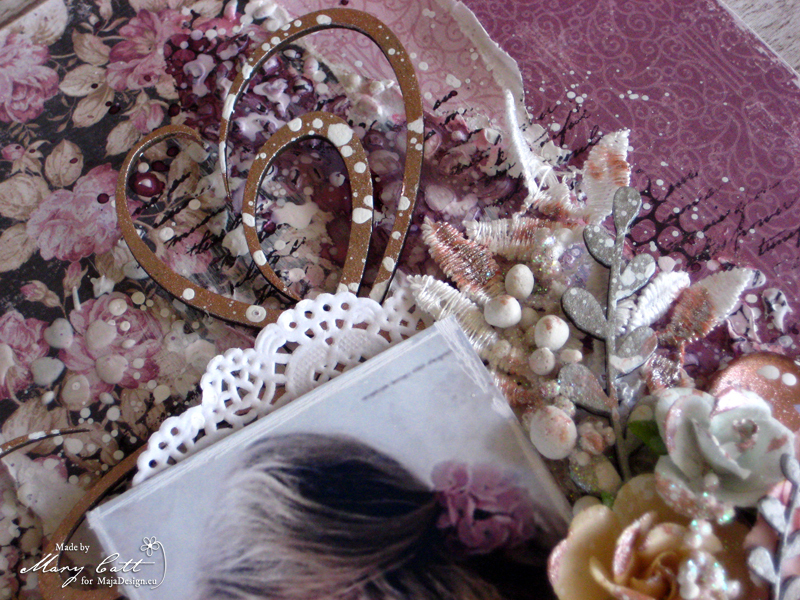 Other Products Used: Magnolia Rose Leaf die, Tim Holtz Tattered Florals dies, Flower Shaping Tools, Tim Holtz Distress Tool, Gesso, Twine, Sentiment Stamp, Script Stamp, Grunge Stamp, Archival Ink in Timber Brown, Sewing Machine, Thread. It’s been such an honor to have you visit today! I hope you’ve enjoyed spending some quiet moments in my little garden. If you like these papers or any of the others you see here on the blog, you can bring them home with you by clicking on the STORE FINDER tab, and the magic of the internet will do the rest of the work. I wish you a day filled with all things good and wonderful, and of course, crafty adventures! It’s March now and everyone is waiting for spring because we have had enough of the snow and coldness. new world unfolds around you, offering a nature experience of a different kind. the first to peek through the soil are the snowdrops, daffodils and crocuses. I was able to discover them in my garden before winter came back. But what is one of my favorite sayings? and a little paper doll from Tim Holtz. to make the sun shine on us again. Mary with you today to share my inspiration for March. 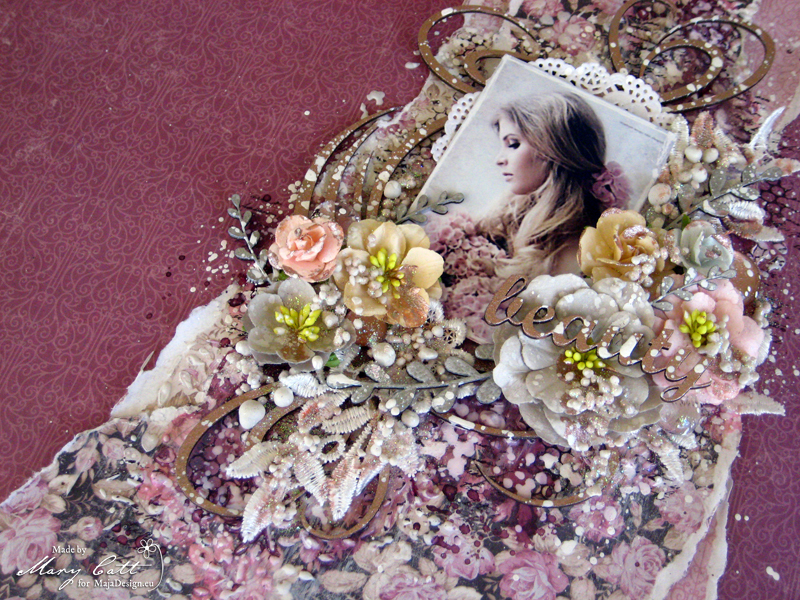 I made a soft romantic page with lots of flowers, laces and chipboards. As you may already know, I love searching on Pinterest to find photos to scrap and this time I came across with that beautiful photo. And, the new gorgeous ”Celebration” collection was just perfect for it. But, before I continue more I want to give all the proper credits to the ”unknown” photographer. I used the ”All Dressed Up” paper for my background and I added some layers on it with the ”To the Party”, the ”Jubilee” and the ”Good Times” papers. First, I gave my background a coat of clear gesso. When it was dried, I added some texture with modeling paste and a stencil. I made some stamping here and there and continued by coloring my page with the ”Cotton Candy Pink” and the ”Open Arms Amethyst” Lindy’s Gang spray. 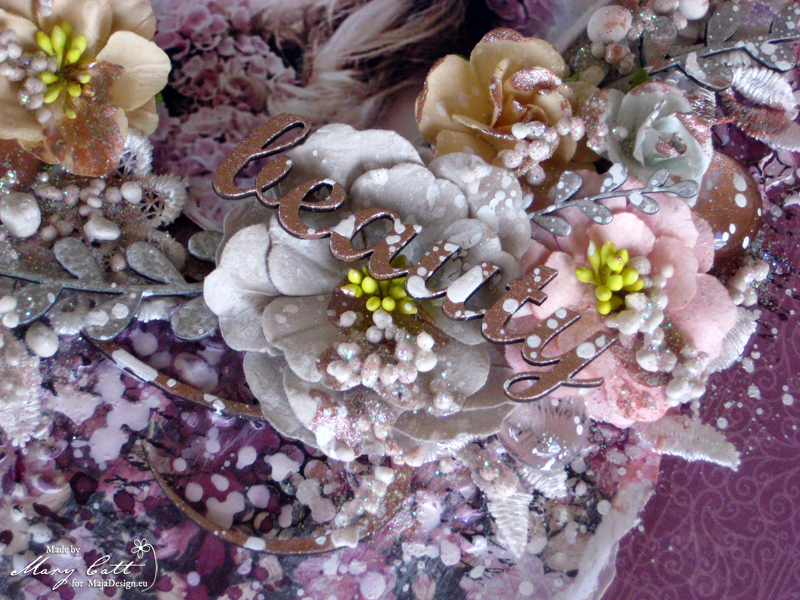 I painted the ”Swirly Frame” chipboard and the word title with the Sparks ”Butterfly Spells” acrylic paint. 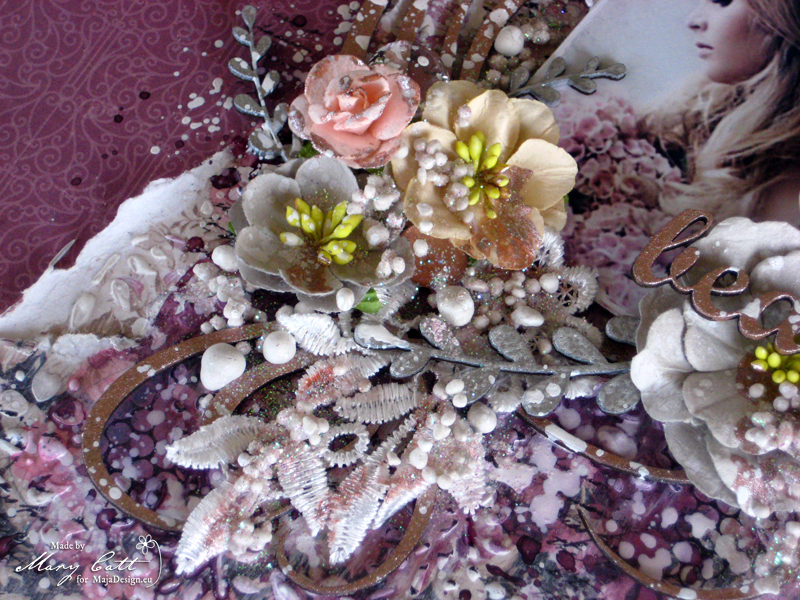 The ”Foliage #10” chipboards were also painted with the metallique ”White Pearl” acrylic paint. The chipboards I used are Dusty Attic. When everything was glued down, I added some art stones and sprinkled some glitter on them. The final touch was made with some splatters with white ink.